When looking for a dentist for your children, it can be tough to know who to see. Should you search for a general family dentist or would your children benefit from pediatric care? You can’t go wrong either way, but it’s good to have all the facts before you make a decision. Both accredited general and pediatric dentists have the training necessary to offer a high level of care to children. If you have an existing relationship with a family dentist you trust to provide quality care, that dentist can be a great option for your littlest family members. Pediatric dentists are also a great option for addressing certain needs children may have. Some kids have particularly high levels of dental anxiety. 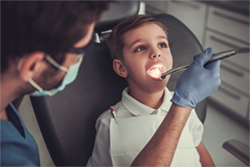 While general dentists often provide assistance with this anxiety, pediatric dentists may be specially equipped to reduce anxiety for children with toys or music that help them relax. They’re also trained to provide care for children with special needs like cerebral palsy, Down syndrome, muscular dystrophy, learning disabilities and others.11 These conditions can be associated with dental problems such as gum disease, so oral health care is especially important. If you’ve decided to visit a pediatric dentist, learn how your dental benefits apply. Some plans limit referrals to specialists or may require you to have a referral from your general dentist. Others allow families to maintain a pediatric dentist as their primary dentist.12 Check your plan to make sure. In any case, visit a specialist that participates in your plan’s network. Delta Dental’s website allows you to search for in-network specialists close to you. Whether you choose a general or pediatric dentist, scheduling the first visit early is crucial. The American Academy of Pediatric Dentistry recommends all babies see the dentist within six months of getting their first tooth but no later than their first birthday. Keep your children smiling into adulthood by finding a dentist you trust today.